I was thrilled to receive a pre-publication copy of Adriana Trigiani’s new book, Kiss Carlo, which goes on sale June 20. This post is more of an homage than a review. I’ve loved Trigiani’s books since my cousin Nina first handed me Lucia, Lucia in 2004. Since then, I’ve read them all. Suffice it to say that I can relate. Take those wedding reception sandwiches in wax paper bags that Trigiani describes in Queen of The Big Time, which is set in Roseto, in the Slate Belt of Eastern Pennsylvania. The only real memory I have of my grandmother is being in her kitchen in Maine, with all the other Italian women from Smith Crossing, as they made and packaged sandwiches in wax paper bags for my Auntie Anna’s wedding. Trigiani is a masterful storyteller. Over the years, I’ve followed the immigrants she writes about faithfully, as they left their tiny, impoverished villages to build new lives in the US, in locations as diverse as Minnesota, Manhattan, Hollywood, the Blue Ridge Mountains, and Roseto, of course. You get to know Trigiani’s complicated characters through big screen-worthy dialogue, within a carefully honed historic and cultural context. Expect to laugh out loud at, fall in love with, get mad at, and cry over them. These are characters you miss when the book ends. One of the things I love most about Adriana Trigiani’s books is that they have real-life inspirations. The Shoemaker’s Wife, for example, was based on her grandparents‘ story (the link is to a video trailer you will love). At the same time, her novels reveal the important mark that Italian-Americans have made on this country, what they endured, and the artistry and traditions they contributed (see her in the PBS tour de force, The Italian-Americans). The big, noisy Sunday dinners, the church at the center of family and community, the downright biblical family feuds may seem stereotypical to an outsider, but we insiders understand that they reflect what we grew up with… and, for good or ill, crawled out of. Kiss Carlo is set largely in one of the nation’s most iconic Italian-American communities, South Philly. It’s a BIG story—a saga, in fact, through which Trigiani has wound what may seem an unlikely Shakespearean thread. This shouldn’t be too surprising. Apart from my humble opinion that everything you need to know about life can be found in Shakespeare, Twelfth Night, the play that figures in the plot, is a tale of masquerade and discovery. Throughout Kiss Carlo and all of Trigiani’s work, it seems to me, runs the theme of first and second-generation Italian-Americans struggling to find out who they really are and who they can become when they are finally confident and comfortable in their New World skin. As I said before, I can relate. I’m sure my parents could have, too. Kiss Carlo was a great read. I think you’ll like it. 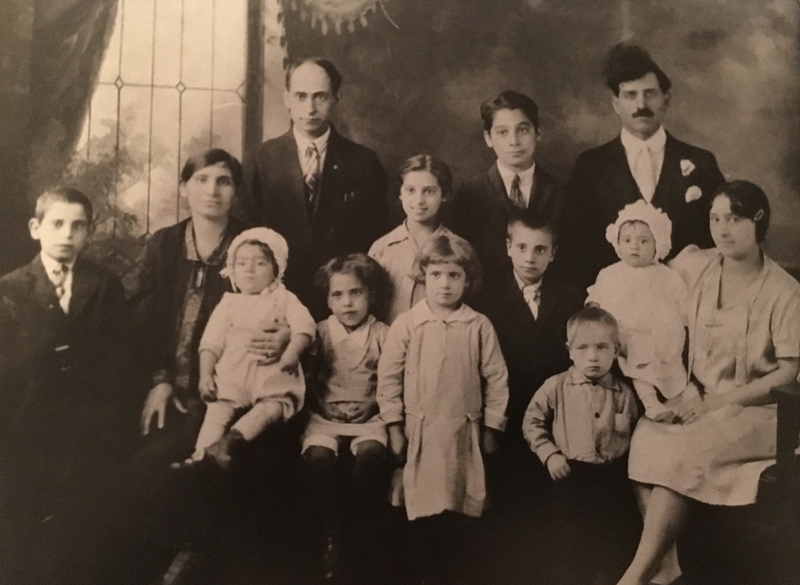 Photo: My paternal grandparents, Maria Grazia and Francesco, second and third from the left, were immigrants from the village of Centrache, in Calabria. They settled in the tiny paper mill town of Rumford, ME. They had 14 children—all but one born in this country—and many, many grandchildren. I’ll watch out for it. I’m just in the last 30 pages of The Supreme Macaroni Company (just past the sad bit 😦 ). I hope you read the first two in the trilogy. I just love Valentine!